Tropical Storm Andrea passed through N.C. in early June dumping up to 5 inches of rain in the Piedmont area. The first graph shows the rainfall pattern. The second graph shows that the lake level rose by 5 feet as a result this rain. It caused the lake's shoreline to move hundreds of feet up into the woods. We wanted to use this extreme rainfall event to show once and for all that the Haw River brings huge amounts of trash to the lake from the 1,400 square miles of watershed reaching up to Greensboro. Thanks to photos taken by Stephen Harrison of the U.S. Army Corps of Engineers, we were able to show the trash making its way down the Haw River Arm and ending up far into the woods of coves near the dam. Hundreds of bags of trash and tires were removed from these same coves during many events held between October 2010 and March 2013. The shoreline and adjacent wooded area had been thoroughly cleaned. Click below to see photos taken on June 8 and 18 at Coves 1-4 and in open water of the Haw River Arm. We will be asking our volunteers in the months ahead to remove this new load of trash and tires. 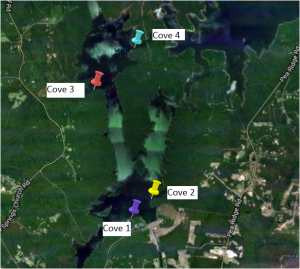 Obviously, trash and tires will continue to enter Jordan Lake until the public becomes better educated about the environmental consequences of littering and illegal disposal in the watershed. Moreover, as difficult as the task may be, county governments will need to enforce anti-litter laws and expand recycling programs before we can keep the Jordan Lake shoreline free of trash.